How to "Just Get the Words Down"
I've talked about a certain technique for writing firsts drafts many times on this blog, and I usually refer to it as "just getting the words down." You may also know it as "word vomitting," "ugly writing," or "writing without editing." All of these are appropriate terms. But while I've explained this technique briefly, I've never explained it very deeply or discussed how and why it's a helpful technique. So today, we're going to look a little deeper at the concept of "just getting the words down." When it comes to first drafts, "just getting the words down" is my go-to technique. Actually, I think it's a necessary technique that every writer should at least try. It's exactly what it sounds like--just get the words down. The idea is to forget trying to make everything sound nice and pretty and edited. Don't worry if you're being too wordy. Don't worry if the dialogue is straightforward and stiff. Don't even worry if your character sounds cliche and dumb. 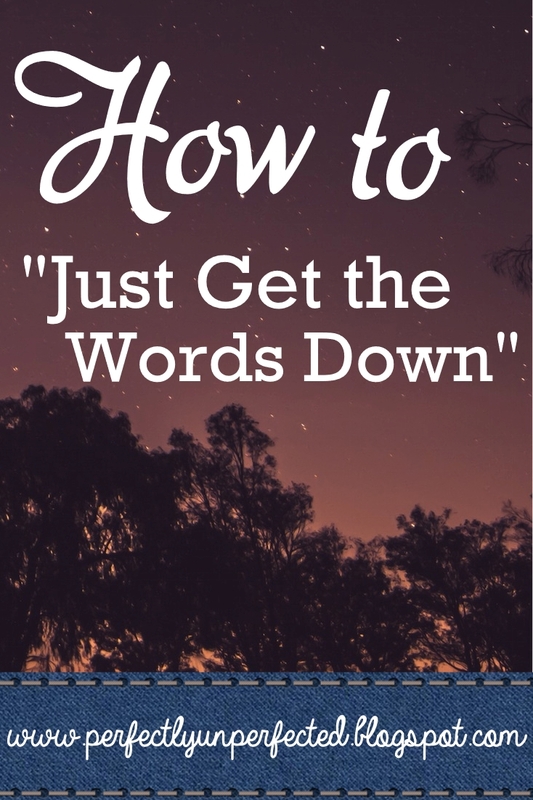 Focus on getting words down--even if those words are horrifically terrible and make you seem like an awful writer. This technique is my favorite for a number of reasons. But the main reason is because it's fast! When you stop focusing on whether or not it sounds good and only focus on getting the words down, it's amazing how much time you save. I went from writing a hundred or so words a day (maybe) to reaching into the thousands per day simply because I stopped trying to force my first draft to sound like a third or fourth draft. This technique is also really helpful because it allows you to move onto other parts of the story in a much shorter time. For example, I was really stuck on a chapter on Sunday evening, and it was killing me. All I wanted was to get to the next chapter, but I couldn't just skip ahead because I knew I would never come back to the chapter I was stuck on. So, I focused instead on just getting words down. I didn't even think about if the chapter was long enough! Within a half hour, I was unstuck and moving on to the chapter I was excited for. Finally, this technique is helpful because it helps you relax. I don't know about you, but I can get really stressed out and frustrated over my writing. Sometimes it's a difficult task, and that makes staying motivated really difficult. But when you switch your focus to just getting the words down, a lot of that stress goes away. It's amazing how freeing it can be! Won't my writing sound terrible? Yes, yes it probably will. But that's okay! This technique is for first drafts, which means there will be plenty more drafts in which you can edit your heart away. So while yes, just focusing on getting words down won't produce your greatest writing (but it might!) that writing won't stay terrible. You can go back and edit during later drafts. 1. Use the technique for first drafts only. 2. Write without editing or (basically) thinking. 3. Focus on progressing instead of making things perfect. 4. Try not to reread what you've written. Like I said, this is one of my favorite ways to write first drafts. It's fast, simple, and helpful. Now put on some writing music, open up your WIP, and just write! Writing to Music: Lyrics or No Lyrics?